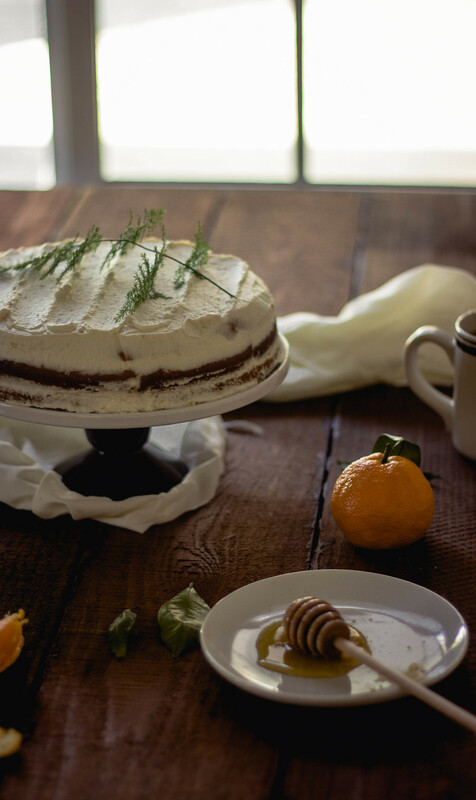 If you decide to make this cake or simply want some out-of-the-ballpark-good satsuma mandarins, make sure to get the brightest ones with super thick, loose skin. These are surprisingly the sweetest and juiciest ones and if I may, I even recommend buying them from the Korean store because the prices are much cheaper since there is such a high demand from our Korean kinfolk. Hope you give it a try and happy baking! Preheat the oven to 375 F degrees (191 C). In a medium bowl, stir together the flours, baking soda, baking powder, and salt. In a stand mixer bowl, or a large mixing bowl and a beater, beat the egg whites at the highest speed until foamy. When it has become a bit uniform, add the white sugar and beat a little more until the mixture is able to make little foam peaks. Go back to the bowl with flour ingredients and add butter, milk, honey, zest, juice, and vanilla. Fold together with a spatula gently until decently incorporated. Then add the egg white mixture into that same bowl and gently keep folding until everything mixes thoroughly, but don't over beat. In a lightly greased cake pan, pour in the batter and bake for approximately 20 minutes or the top is risen is slightly golden. While the cake is baking, wash and dry the stand mixer bowl along with the whisk. Chill the bowl for 10 minutes and begin. Beat the whipping cream on the highest speed for about 1 minute or until it forms some shapes in the cream. Turn off and add egg white, beat for another 15 seconds. Then add sugar, honey, zest, and vanilla and beat just another 20 seconds. Scrape sides as needed. When cake is cooled down, carefully cut into 3 layers with a serrated knife. Dust off excess crumbs and spread whipped cream accordingly. Have you tried mandarin or tangerine desserts before?